In order for African American children to develop positive racial identities, there needs to be buy-in from parents, educators, and the community as a whole. We engage the public on topics relating to race, education, and young children by hosting powerful speakers to discuss these critical subjects. The sessions are both educational and interactive, with audience members encouraged to ask questions and participate in the discussion. The P.R.I.D.E. Speaker Series began in 2017 and welcomes speakers for Fall and Spring events. Previous speakers have included noted scholar and psychologist Dr. Beverly Daniel Tatum, who wrote the seminal text Why Are All the Black Kids Sitting Together in the Cafeteria, University of Pittsburgh School of Education Dean Dr. Valerie Kinloch, and University of Milwaukee-Wisconsin professor and National Museum of African American History and Culture consultant Dr. Erin Winkler. Join The P.R.I.D.E. Program for an evening of engaging discussions on Thursday, May 2 from 5:30 – 7:30 p.m. at the Carnegie Library – Homewood Auditorium featuring Muffy Mendoza. Mendoza is an author, parent, and founder of Pittsburgh Brown Mamas, a support from for mothers of color. Her keynote will focus on how parents and educators can team together to nurture young Black children. 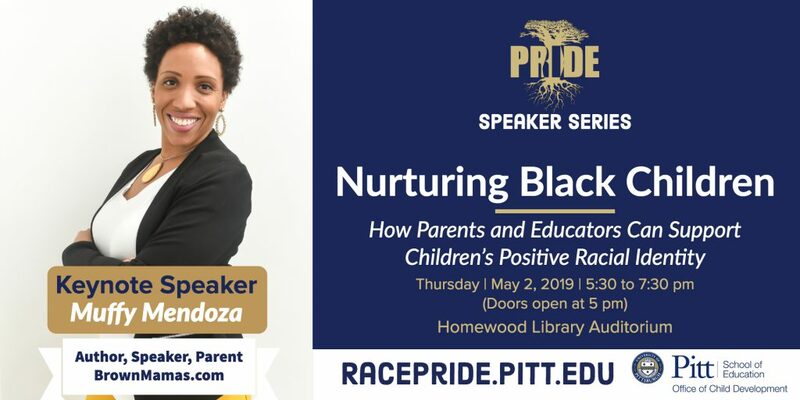 Following the keynote, she will join a panel discussion of strategies that support young children's positive racial identity. We have to have a discourse of love that we enact and practice in all of our space and in the work that we do. Not exclusively for young children and adults, but importantly for young children and adults.